My time to enter the nib making sanctuary arrived when they had slitting problems. The cutting blade manufacturer had substituted their ten-year-old product and had stopped its production, which had been slitting our nibs, reliably. The replacement discs did not. There had been a warning from the manufacturer but who would have thought it would cause such a problem. New is always synonymous with progress, with being better. The slitting machine operators were highly skilled; they positioned the nib and advanced the cutting disc manually. They would approach the iridium bead slowly, and once the disc had scratched its surface, providing had a centring groove for the disc, then they would apply more pressure. Once in the stainless steel, they progressed more rapidly to the end stop of the slit or the hole. To centre each nib they used the bead, visually aligning it using a loupe with markings. They did not use any lubricant because they could not see otherwise. I felt the solution lied in the field of being able to use a cutting lubrication. It was the time to build an automated machine where lubrication would not be a problem, much against the workers’ resistance. I promised not to tell anyone, it would all remain behind closed doors, as usual. But this time, I was inside. By now, we had run out of some nib styles and sizes. The pressure was on. My previous project had been in the ball pen tip production, where I had learned about lubrication. All the secrets in ball pen production lay in the way lubrication is applied and what lubricant is used. From this project, I knew the right words and the technical sales bloke of a reputable lubrication manufacturer. The introduction of a numerically controlled advance system, (in-house custom built) and the right lubrication soon solved the cutting dilemma. , and I became the hero of the nib department. Further to that, it reduced the forming of burs thus the time of rumbling, the mechanised de‑burring process, which occasionally damaged the nib. And like so often there is good in challenges, because without this problem occurring how else would I have entered into the nib manufacturing section? The material for the nib, either gold or stainless steel, was delivered in sheets or rolled up strips. In preparation for production, half metre long strips were cut for ease of handling. As the second step, this strip was feathered so it would stay straight during rolling. The strips were passed through rollers, which left one edge of the strip at almost its original thickness, while the other edge was reduced down to about two-thirds its thickness, sketch 1. This work hardening would double or triple the hardness. 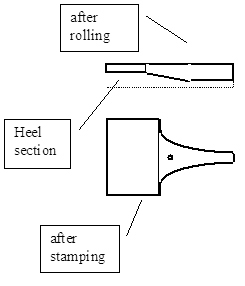 The hardness of the thinner section would improve the stability of the nib, resulting in a firmer grip of the heel on the front part of the feeder and it would help the nib to set better in this section. The gradual increase in thickness would provide the nib with its characteristic elasticity and allow the opening of the slit under pressure in the desired way. Another reason for this reduction in cross-section is the price of gold. Rolling a gold strip in this fashion would reduce its weight by half (and half its cost) without any detriment to appearance or function. It actually approves function of the nib. Stainless steel nibs could have been manufactured flat, but they have to fit on the same shape feeder and the nib production tools. Therefore they are produced in the same way. After rolling the so-called breather hole is punched into the strip, sketch 2. They were used as locating holes for the stamping out the flat shape of the nib and the subsequent forming, the placement of embossed imprints and for centring during the tipping process. 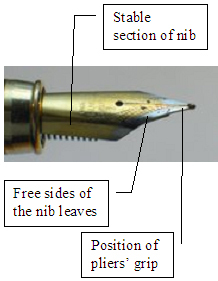 The shaping of the nib was completed by an initial polish to remove the burrs caused by the stamping process. After tipping and slitting the nib, there was a second time of drum polishing; it was much shorter, and the aggregate (small pieces of wood and shells of almond kernels) was softer. The tipping process entails the welding of the tiny bead of iridium onto the tip of the nib. Three different size beads were used for the various widths. The beads were welded on, using electric resistance welding under an inert gas atmosphere. Generally, when resistance welding, the materials of the components to be joined need to have a similar melting point and the amount of energy required to bring both parts to their melting points must be approximately the equal so that they melt in the same time span. In case of nibs, this is not the case. stainless steel’s melting point is around 1430 ºC. Non-matching parameter would vaporise one component before the other would melt. Dilemmas such as this are part of an ingeneer’s life; you love it or change your profession. We did it and kept our success humbly quiet. During my fountain pen days, all nib tips were manually shaped to a specific width and angle. After the slitters, the tip shapers were second in the pecking order. Shaping was performed before the slitting. The burs were removed during final polishing. During those days I was a bit of a calligraphy buff, I learned how to shape tips. Just a comment: In the sketches I left the tip round, spherical for ease of drawing. About the slitting, I have talked already extensively at the start of this chapter. I mention it here because of the completeness of the sequence. The setting was another labour intensive, highly skilled process. It involved two actions. First, the slit needed to be closed again on the tip otherwise the ink would not move towards it. 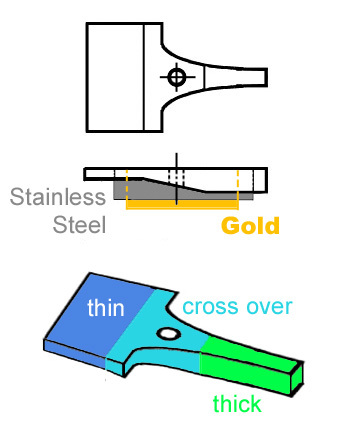 When the slit is cut with a diamond blade, sooner or later, the slit would even widen towards the point due to uneven wear on the cutting blade. When this non-parallelity became too much (more than 0.1mm) the end of the utility of the blade had been reached. The tines were brought together through impacting on their outer edge, the free side of the nib leaf, photo 2. Through this impact, the material would be elongated in this section. As a consequence, the slit would close at the tip. Often this impacting would happen on the underside or through embossing of ornaments. At this stage of manufacturing, the ink would still stay in the slit and not cross over to the paper surface, unless pressure is applied to the nib and paper fibres are brought into contact with the ink. Therefore, even the nib production is completed, the fountain pens return to the final nib manipulation after the nib has been slipped onto the feed, which by then has been inserted into the grip section. In this second setting process, the nib leave was grabbed close to the bead with a small pair of flat pliers. The tine was rotated inwards until a minute plastic deformation occurred. A residual bent was achieved leaving an upside down “V” shape, when viewing the bead front on, sketch 3. In the sketch, I have emphasised the bending of the tines as well as the proportion of the opening. In reality, this shaping is very tiny, namely in the range from 0.15 to 0.25, also depending on the width of the nib. I just remembered: this was the way, we did it 30 years ago. I am sure, today the process would be mechanised. The final touch was given through de‑burring the edge of the gap in the bead with a knife blade shaped (oil free!) diamond polishing stone. I marked the area in red in sketch 3. The result was the smoothest writing you have ever experienced. Through this shape, the lower section of the slit would always remain apart, which would be filled with ink. Through a gentle touch only, the fibres of the paper would enter into that gap and readily absorb the ink. 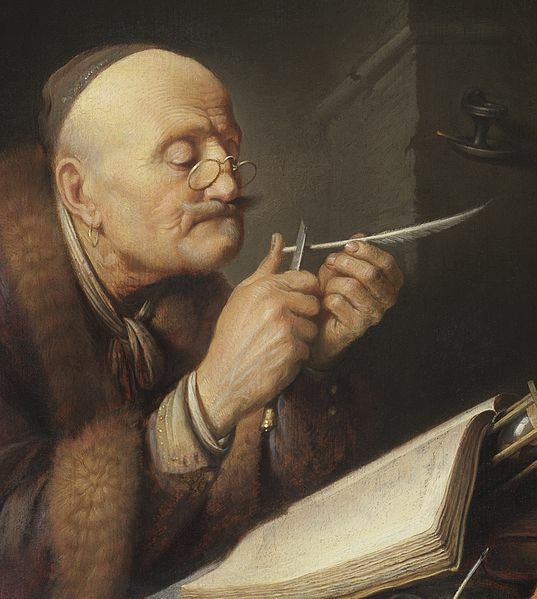 I have described this in the chapter on Pressureless Writing on the page Nib Mechanics towards the end. All this setting was highly skill based and relied on trial and error and had to be tested continuously. Therefore, this happened all while ink was on the nib. What a messy business. You could not wear gloves, they would prevent the right feel, nor use barrier cream because if it would change the nibs performance, which would interfere with the setting procedure. Setters always had blue fingers, it was an unspoken sign of their elite kudos. In days of old, it would take about four months to break in a new nib through the wear caused by the owner’s personal writing style. I remember, when some earnest writers would come to the factory to pick up their fountain pen and experienced setters would help them through this process in a few minutes. The personalisation happened when the slightly shocked owner would be asked to write their signature about twenty times on 1000 grid polishing paper. And… occasionally, a customer would ask about the people who make it all work. Those would have been some of the highlights of my working life when I had the opportunity to meet a customer. Sometimes, they asked questions, and occasionally, I would give them a company tour. Hello dear Sir: You are a Master! Your blog content is excellent… You are a man neccesary in Foro de Estilograficas… Your participation would be very useful!